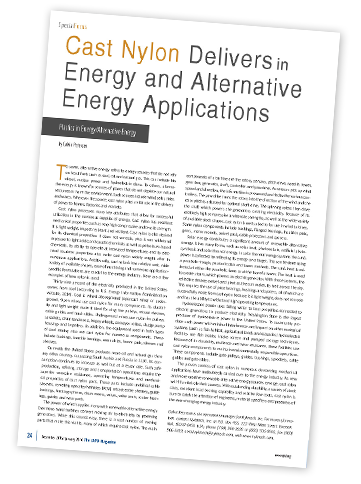 To some, alternative energy refers to energy sources that do not rely on fossil fuels such as coal, oil and natural gas. This can include bio diesel, nuclear power and hydroelectric dams. To others, alternative energy is known for sources of power that do not deplete our natural resources or harm the environment. Such sources include wind, solar, tides and waves. Wherever the source, cast nylon plays a vital role in the delivery of power to homes, factories and markets. Cast nylon possesses many key attributes that allow for successful utilization in the numerous supplies of energy. Cast nylon has excellent mechanical properties such as very high compressive and tensile strength. It is light weight, impact resistant and resilient. Cast nylon is also desired for its chemical properties: It does not corrode, plus it can withstand exposure to light acidic and caustic chemicals as well as petroleum-based chemicals. Its ability to operate at increased temperatures and its electrical insulator properties also make cast nylon widely sought after in numerous applications. Additionally, cast nylon’s low relative cost, wide variety of available shapes, ease of machining and numerous application specific formulations are crucial to the energy industry. Here are a few examples of how nylon is used. Thirty-nine percent of the electricity produced in the United States comes from coal (according to U.S. Energy Information Administration website, 2014). Coal is mined aboveground (opencast mine) or underground. Open mines use cast nylon for many components. Its durability and light weight make it ideal for drag line pulleys, retract sheaves, cable guides and track slides. Underground mines use nylon for pulleys, sprockets, chain tensioners, bogey wheels, conveyor rollers, sludge pump housings and impellers. In addition, the equipment used in both types of coal mining also use cast nylon for numerous components. These include bushings, knuckle bearings, wear strips, boom pads, sleeves and sheaves. Currently the United States produces more oil and natural gas than any other country, surpassing Saudi Arabia and Russia in 2103. Its consumption continues to increase as well but at a lesser rate. Such safe production, refining, storage and transportation operations require the superior corrosive resistance, operating temperatures and mechanical properties of cast nylon parts. These parts include umbilical cable sheaves, remotely operated vehicles (ROV) retract cable sheaves, guide bushings, fracking spheres, drum covers, valves, valve seats, rocker bushings, guides and wear pads. The power of wind supplies many with renewable alternative energy. Enormous wind turbines convert moving air to electricity by powering generators. While this sounds easy, there is a vast number of moving parts that make this viable, many of which require cast nylon. The main components of a turbine are the rotors, sensors, pitch drive, nacelle, tower, gear box, generator, shaft, controller and yaw drive. As sensors pick up wind speed and direction, the information is processed and fed to the various controllers. The yaw drive turns the rotors into the direction of the wind and the rotor pitch is adjusted for optimal shaft drive. 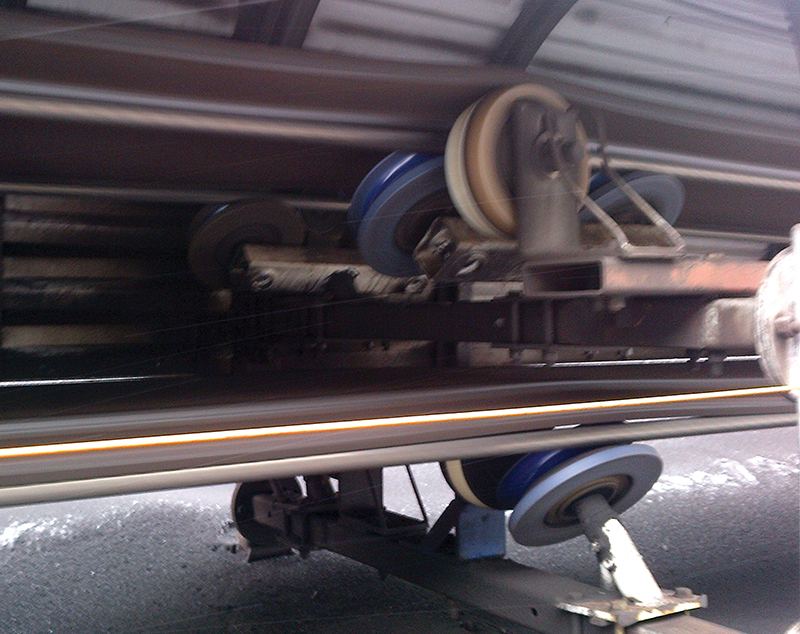 The spinning rotors then drive the shaft which powers the generators creating electricity. Because of its relatively high compressive and tensile strengths, as well as the wide variety of available stock shapes, cast nylon is well suited to for use in wind turbines. Some nylon components include bushings, flanged bearings, insulator pads, gears, motor mounts, swivel pads, cable protectors and spacers. Solar energy contributes a significant amount of renewable alternative energy. It has many forms, such as solar heat, photovoltaic, artificial photosynthesis and solar thermal energy. In solar thermal energy systems the sun’s power is collected by reflecting its energy on a target. This can be done using a parabolic trough, parabolic dish and tower methods. The sun’s heat is collected at either the parabolic focus or at the top of a tower. The heat is used to create steam, which powers an electric generator. With these systems, the reflective devices swivel and pivot as the sun makes its trek across the sky. This requires the use of pivot bearings, bushings and spacers, all of which are successfully made from cast nylon because it is light weight, does not corrode and has the ability to withstand high operating temperatures. Hydroelectric power uses falling water to turn propellers connected to electric generators to produce electricity. Washington State is the largest producer of hydroelectric power in the United States. To sustainably produce such power with minimal interference and impact on other ecological systems (such as fish habitat, agricultural lands and estuaries) hydroelectric facilities use fish ladder, intake screen and pumped storage techniques. Because of its durability, resilience and wear resistance, these facilities use cast nylon components to maintain environmentally responsible operations. These components include gate pulleys, guides, bushings, sprockets, cable guides and gate slides. The proven success of cast nylon in numerous demanding mechanical applications have undoubtedly carried over to the energy industry. As new and more creative renewable alternative energy sources emerge, cast nylon will fill a vital role their success. With outstanding durability, a variety of stock sizes, excellent load bearing capability and relative low costs, cast nylon is sure to catch the attention of engineers, material specifiers and procurers of the ever-changing energy industry. Originally published in the International Association of Plastics Magazine Dec/Jan 2016 by Calvin Petersen, Operations Manager for Nylatech, Inc.